BOOM! Studios is a publishing company that was founded by Ross Richie in 2005. They have worked with brands like Disney, The Muppets, Star Wars, Pixar, etc. They have been nominated for several Eisner awards. This 224-page paperback is to celebrate the company's 6-year anniversary. It collects mainly illustrative work like comics and posters. The art is wide ranging. There are the inked comics, painted stuff, and the more cartoon style for Disney. Some of the work are licensed comic books in partnership with films, like 28 Days Later, Rise of the Planet of the Apes, Die Hard. Artists featured include Mike Mignola, Sean Phillips, Dave Johnson, John Cassaday, Tim Bradstreet, Rafael Albuquerque, Peter Krause among others. There are lots of artists. The quality of the art is high as you can probably guess from the names mentioned. 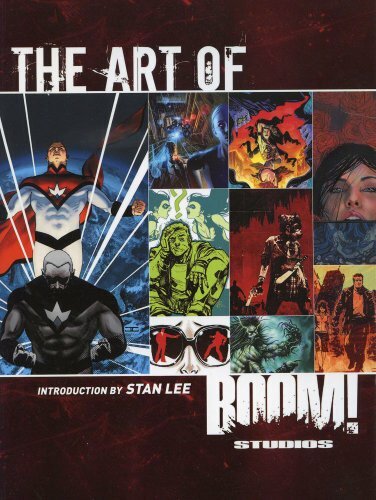 Great book for comic art lovers. It's a good showcase for their titles and artists.